Trudy Benson is an artist who lives and works in Brooklyn, New York. She was born in Richmond, Virginia. She earned a BFA from Virginia Commonwealth University and a MFA from Pratt Institute. Her work has been reviewed in the New York Times, Artforum, ARTnews, and Modern Painters, among others. She is represented by Galerie Bernard Ceysson. Your show "Spooky Action at a Distance" opens May 18th at Half Gallery. Can you tell us a bit about the new work? The exhibition title comes from quantum physics. "Spooky action at a distance" is basically the idea that an object can be moved or changed without being physically touched. I like this concept in regards to painting because I think about painting as a series of layers, which never really touch, but influence each other. In my paintings there is no wet-onto-wet painting, and there are a few periods during creation when the work totally stops. The painting has to dry between layers. The result of the intuitively additive process is usually that the layers are informed by each other but not totally aware of each other. A number of the paintings are influenced by the abstract films of Robert Breer. I liked the idea of painting in terms of sequence and time. I always think about my paintings as explicit about process and sequence of paint application. Through surface, even areas that are painted over reveal a series of actions. Your work appears to be this really dynamic mix of 21st century digital technology with late mid-century abstraction, and even merging in other elements like neo-geo. Is that a crazy interpretation or in the right direction? In past shows I discussed the process of my work through the language of computer imaging, but the new work is much less literal. My process involves discreet layers of different types of paint and paint application, so I think in that sense the digital references are still present in the work. I use sprayed acrylic paint (through an airbrush), painted acrylic paint, masking tape, extruded oil paint, oil paint rolled onto the canvas with a house paint roller, and painted 1shot enamel. The paintings have a variety of surface quality, from raw canvas to enamel painted over oil paint squeezed directly from the tube. There’s definitely a chopped and screwed visual aesthetic. Can you talk a bit about the importance of scale in your work? Scale is very important in my work. I generally prefer to work larger (about 5 feet up to 7 feet). When I see a painting that has something for the viewer at 20 feet away, and at 2 feet away, and at 2 inches away, I feel that is a more rewarding painting. From 20 feet away, there is a legibility to the work, and as you get closer to the work, ideally you will learn more about the process of the painting. On the other hand, scale is equally important in smaller works. The extruded oil paint becomes more physical, and less about line. Smaller works are always a challenge for me, and this show is primarily smaller works. I think one of the reasons painting is so important is that is still made from scratch and fully exists in the material world. The surface of my paintings are essentially how I communicate this. What is a typical day in the studio like for you? I usually start the day by watering my plants and having a coffee with the paintings. I listen to best-sellers through my headphones while I paint. I like crime dramas with a female narrator. I’m not fully invested in the story, but it helps me to stay focused and keep my hands off my phone. There is a lot of down time in the studio. I could spend days on one layer of a painting and then spend a week without touching the painting. I always work on 4 or 5 pieces at a time, in various stages of completion. Since my process requires these breaks for drying, I have a lot of time to think about what the next action might be. The works vary in pace during their creation, and the slower times are when a lot of rehearsing happens. I usually make small sketches of potential paintings during these breaks. Who are some of the artists you feel an affinity to, or consider part of your creative circle/community? Elizabeth Murray is my hero. I think artists usually feel very strongly about her work - they either absolutely love her or absolutely hate her. Her paintings are boisterous but also have these intense moments of concentrated beauty. Katherine Bernhardt is an artist who I admire but also have had the pleasure of exchanging studio visits with. She is a natural and I don't think there is anyone making better paintings than KB right now. 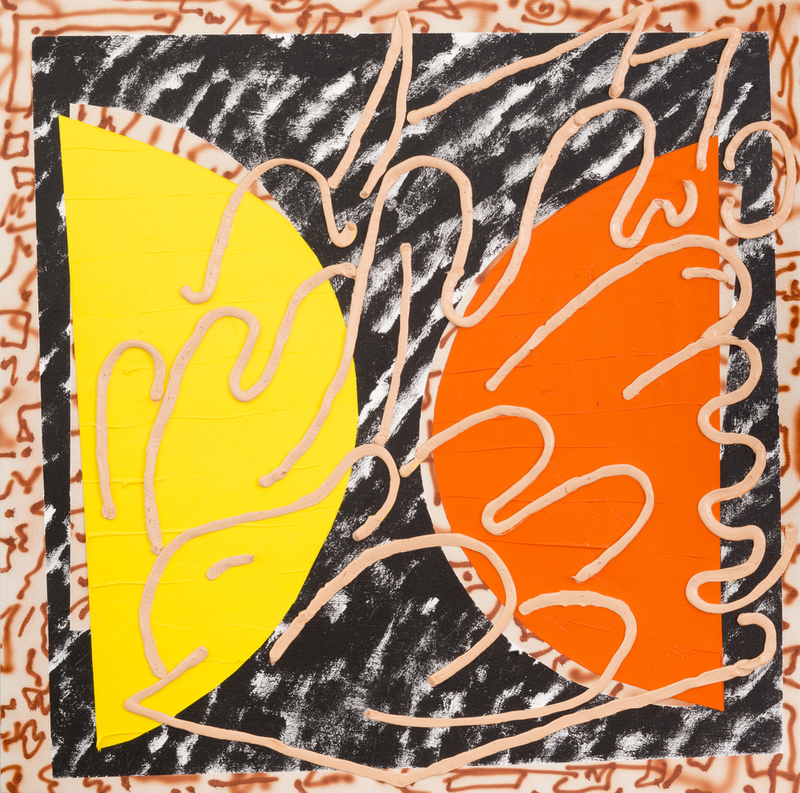 Jonathan Lasker is such a generous painter, his recent show at Cheim & Read was fantastic. I think my work wouldn't be what it is today if I had never seen his paintings. I have an upcoming exhibition in Luxembourg at Galerie Bernard Ceysson. I made both shows at the same time, so there is a lot of overlap. A couple of my most recent paintings have left a lot of raw canvas visible. They are like swiss cheese paintings. I feel like I am constantly removing things from the work, while trying to keep the paintings maximal and expansive.